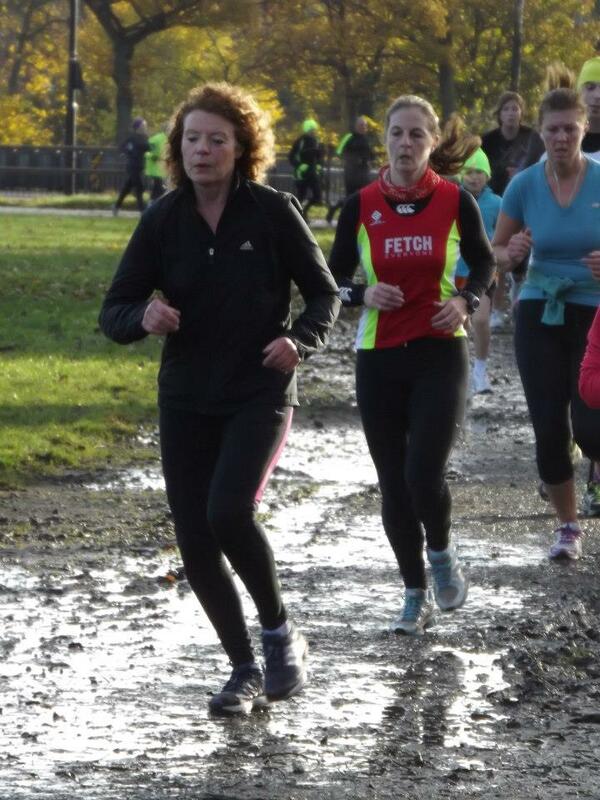 On Saturday I made my return to running Newcastle parkrun. I knew it had been a while since I’d run 5k what with Great North Run training, going on holiday and then recovering from a sprained ankle; and when I looked it up, I hadn’t run one since August. Easing back after my injury with run walk sessions and trying to make changes to my running style to land more midfoot, forefoot, I really haven’t been running a lot, so I was a bit nervous when I woke up, especially as my ankle felt a bit stiff. Should I give it another week to recover? Tackling the muddy patch by the military museum. Photo courtesy of Mick Durnion. Pottering around, getting ready, it soon eased up and I decided to just go with my plan of trying to get round midfoot/forefoot landing and to make that my goal. It meant I had no idea of what time I would do or how to pace it, it would just be run it and see. Happily it was the most beautiful day for a run on the moor. Bright, crisp and cold, but with barely any wind to speak of and as the sun came out it soon warmed up. And as I’ve been volunteering quite regularly it felt like situation normal to meet up with other parkrunners and say hello to the usual crew. This was to be one of the monthly paced events, and after saying hello to Sue sporting the 35 min pace shirt and catching up with Penny, I went off to do my running drills warm up. Some heel kicks, knee lifts, bounces, bounds, side shuffles and high kicks later, I was ready to start. I positioned myself firmly mid pack, chatted to a couple of nearby runners, heard some of the 50 shirts being given out and set my Garmin on the sound of the starting air horn. And then it was away and off over the paths and into the sunshine. Steady, steady, steady I coached myself, small steps, kick back, land under the centre line, keep it light and turn your legs over. Picking my way through the usual crowded start I soon found my space and powered on, hoping my natural enthusiasm hadn’t taken me away too quickly. But my breathing felt good and I was stepping lightly, listening for the sound of my own footsteps, trying to stay relaxed and focused. I said a cheery hello to Fred (our usual tail runner) as I passed and really started to enjoy the sensation of running at a decent pace. Then out of the corner of my eye, I spotted a green pacers shirt right next to me. It was today’s 30 minute man and two thoughts simultaneously went through my mind – ‘30 mins would be good’, and ‘time doesn’t matter, it’s about technique today’. I stuck with him for a while as I thought the pace felt about right, but as we approached gate one, I decided to take off my gloves and stick them in my back pocket and he pulled ahead. Through the gate with a shouted thanks to Malcolm and onto the tree lined path along beside the road. I like this stretch, I always feel good here, although today I was conscious of the slight camber and rough edges of the path, so chose my footing carefully. Through the second gate, and onto the slightly muddy paths on the moor. Again I picked my way through carefully, looking for the smoothest path. Somewhere between 2-3km I passed the 30 minute pacer and did a mental check to see how I was feeling, but I was good, not pushing too hard, just feeling elated to be running and strong. Strong was my mantra through the rough ground behind the Military Museum. Strong kept me straight on through the puddles, ignoring the heavy breathing of the runners around me. Strong pushed me up the gravelly path, running out ahead, on my own towards the turn, knowing I had not much more than a kilometre to go. Back onto the tarmac path and through the gate, it’s a real relief to know that it’s a smooth surface from here all the way to the end. I just focus on keeping my form and look ahead at the groups of runners, telling myself to reel them in bit by bit. At the last left hand turn I make a conscious effort to pick up the turnover again and try to put a bit more into the last half a kilometre or so. I begin to reel in runners ahead. There’s a girl in a fluoro pink top who makes herself nicely conspicuous. I think she’s maybe too far to catch, but she makes a good target. Round the last little dog leg and onto the finish straight and I push for a sprint, hearing Jeff shouting me on, but thinking I can only sprint if I keep my form. It’s the first time I’ve tried it. But power down, legs and arms pumping and I just pip the girl in pink on the line. I feel briefly embarrassed. That doesn’t feel like parkrun sportsmanship. I turn and shake her hand and say “Sorry about that,” but she takes it in good spirit and congratulates me on my sprint finish. We share injury stories as we collect our tokens and wait to get our barcodes scanned. I’m pleased I haven’t upset her. We’ll have the same time anyway. It was a very close finish. Quickly processed with our tokens and barcodes, I wander off to stretch and then catch up with some other familiar parkrun faces, including the legendary Eric Appleby, our 80 year old former champion. Then I go to stand on the last corner to cheer on the runners with Jeff and compare race notes from today. Jeff is full of positive encouragement as always and today I really start to believe it. In terms of performance, my running this year hasn’t been a patch on my glorious 2011 season. But there are good reasons for that and I’ve learned a lot about myself, my training and my focus by having to take a few steps back. Next year will be all about triathlon in any case. But that doesn’t mean I shan’t be looking to do well at a few select 5 and 10k races. For now, I’m just happy to be running again, finding a bit of pace and feeling like there’s more to come. But yes, at parkrun I also saw a glimpse of the possibility that, given time, I could get back to where I was and possibly even better it next year. It’s an exciting prospect. My Saturday continued in fine form too, as I met my friends Ian and Kelda for a sunny walk along the beach with their gorgeous pug. And in the evening we went out to our favourite Newcastle restaurant, Cafe 21 for a pre-birthday meal with Lee and Beth. Food, service and atmosphere was, always, absolutely spot on. And, after radically cutting back on the sweet stuff over the past four weeks, I really enjoyed my indulgent dessert of knickerbocker glory.